This is a great idea for a book, but it was not the book I'd hoped for. Matt and Karen Smith, after becoming empty-nesters, decided to take a two-year break from their careers and visit all of the National Parks. 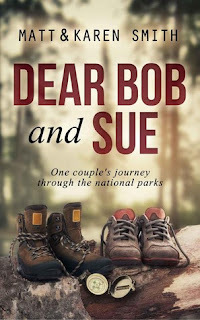 The adventure is chronicled through a series of emails, written alternately by Matt or Karen, to their friends, Bob and Sue. Choosing to document the experience though emails allowed them to adopt a more informal, personal voice and share even the most off-beat anecdotes. I laughed through the first several letters, then quickly began to tire of the tone. Surely their comments were intended to be funny and irreverent, though it often seemed they were taking cheap shots at one another, fellow travelers, and even park rangers. And although I like beer, especially after a long hike, is it really necessary to read about every one consumed over the two years? I think not. Ditto for the peanut butter and jelly sandwiches. I began to enjoy the book more after limiting my reading to two or three letters per sitting. It's definitely better in small doses. After recently visiting four National Parks, it was fun to compare our experiences with Matt and Karen's - hikes, weather, restaurants, lodging, etc. We ended up choosing a couple of the same hikes and one restaurant... Zax in Moab, UT. Shoot. The premise did sound good, but I think I'll pass on this. Beth F - I know... such a great book idea! Your review is exactly why I didn't read this book, which seems designed for me. I love NPs, and the premise is outstanding, but I heard about the cheap shots and took a pass. Interesting that it could actually function as a decent guidebook for specific locations. JaneGS - It's not comprehensive for any park, but interesting to see which trails they chose, lodges/hotels they visited, and restaurants. There's still a great book just waiting to be written on the topic... maybe you could do it?! Yes, yes, yes! This is exactly how I felt about this book (which I haven't finished). It started off with great promise, but the belittling of each other grew old very quickly. I'm reading it now as a reference and also to look back at after we visit a National Park. An index would have been very helpful, but at least with the ebook version, you could do a search. Not as easy with my print copy. I like the premise too, but books like this -- a memoir where the narrator(s) aren't especially likeable -- tend to be problematic for me. But I can see how it could serve as a good guidebook! Audrey - That's true. They may be fine individually, but I just didn't like the way they interacted with each other... sigh. I haven't checked this book out yet but will heed your advice, it's not a guidebook. Sounds interesting though. Thank you so very much keeping up with me during hurricane Michael. It VERY appreciated. Tina - I'm so glad you got through Michael without major damage or injury... such a scary time! The book is worth taking a look at, especially if you can get it free on kindle unlimited. Fun idea for a book, but I can see how some of those elements might get tiring after awhile! Angela - I still think it's a great idea for a book, but a couple of those things definitely grated on my nerves. The lack of an index would really frustrate me. Can you do keyword searches? (asking as someone who is finally slowly finding my way around ebooks). I recently signed up for Kindle Unlimited, for books that I can't get through my libraries but don't want to buy (even as ebooks). Lisa - Kindle has an Xray feature that lets you refer back to previous mentions of names or word... there must be a search feature where you can type in words, too. I need to look into that! This sounds like a unique book but I am not certain about the people who wrote it! Hmm no index? It seems it could have been a better resource with it. They sound maybe a bit too snarky at times? 58 parks though, that's an accomplishment. It seems that you liked parts of it / 50-50? Susan - They were a little too snarky for my taste. I wasn't sure whether to rate this a 2.5 or 3. Certainly not one of the better books I've read, but it did have some redeeming qualities. This sounds like a book I would get from the library. I'd li,e to hear about the parks but the sniping isn't something I'd enjoy. Might have a look to see if library has it. Pam - Borrowing this is a perfect solution. There is some good information, but the tone was too much for me. This sounds like a unique guide. We know a couple that has traveled to all the national parks and all 50 states since they retired 6 years ago. Diane - Wow, I bet they've got some great stories! Doubt we'll ever get to all the parks, but it would be fun to try. Too bad it wasn't more enjoyable. I quickly tire of books told through emails and letters. Thanks for sharing. I do love that cover! I enjoy travelogues but not sure about this one. Iliana - It won't go down as one of the best, that's for sure! I've seen this book before and wanted to read it, then I forgot all about it. I can see where things would get a bit tiring, especially if they were repeated over a 2 year span. Maybe I should forget about it again, or read it in short spurts like you did. Vicki - Reading in small doses is the way to go with this one. It's a great idea for a book, but unfortunately not a great book.